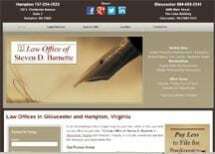 Located in Gloucester, Virginia, the Law Office of Steven D. Barnette, P.C., is dedicated to offering legal solutions with a client-centered focus. Our experienced lawyers represent clients in the areas of Chapters 7 and 13 bankruptcy, family law, personal injury and criminal law. Our law firm provides trustworthy representation. We know that the legal process is daunting, filled with legal jargon and filing deadlines. When you are represented by us, we will translate that legal jargon so you understand what is going on in your case. Our attorneys keep you updated regularly regarding developments in your case, and should you have any questions, they are accessible. While we always look first for favorable settlements, we also fully prepare for trial. If you are an individual considering filing for personal bankruptcy, we will fully explain your options. Filing for Chapter 7 and Chapter 13 bankruptcy are complicated processes, requiring the skilled guidance of a bankruptcy lawyer. We work hard to ensure that you have filed the necessary documentation and accompany you to all hearings so your path to a new financial beginning is as smooth as possible. If you have been injured in an accident caused by someone else's negligence, we conduct thorough investigations into the circumstances surrounding your accident so we can develop a proactive legal strategy. If you are getting divorced, the Law Office of Steven D. Barnette, P.C., works closely with you to find a legal solution that takes into account the best interests of both you and your family. Monday - Friday 9 a.m.–5 p.m.
At our firm, we handle bankruptcy, personal injury and criminal law matters. Learn more about attorney Mike Thomas.